Brief Synopsis – One man play about the life of the first African-American judge to serve on the US Supreme Court and his journey to that prestigious position. My Take on it – I have been a fan of one-man shows like this one and the two that I’ve seen recently – Give ‘Em Hell Harry (1975) and Barrymore (2011) have both been quite eye opening and were able to shed so much light on the lives of those men shown especially from the perspective of their witticisms and personalities. 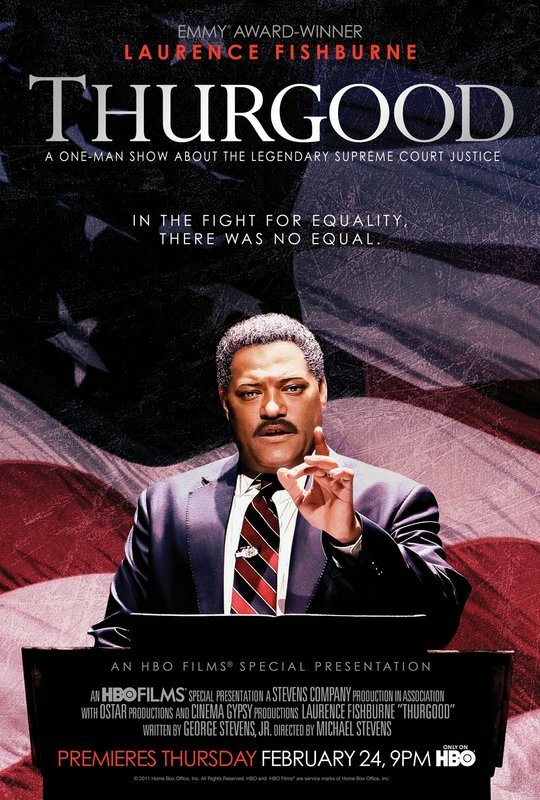 Since I didn’t know much about his life, I hoped that this film would do something similar for the first African-American Supreme Court Justice. Laurence Fishburne does an amazing job with this role and manages to give us something quite interesting and enjoyable throughout. He is able to bring a lot of wit and humor to the character despite the fact that one assumes that he was probably much more of a stickler for seriousness than depicted, but perhaps that preconceived notion is incorrect. They do a wonderful job spanning the lifetime of this great man and are able to focus on some of the key points in his life along with the important impact and impression that he made on the world. The added use of video images and photographs on the screen behind him while he speaks helps bring the viewer much deeper into the times, places and events described. Bottom Line – Great one man show that is wonderfully performed by Fishburne. He is able to bring so much wit and humor to this character who is easily assumed to have been a stickler for seriousness, but apparently is not. They do a wonderful job spanning his lifetime and showing some of the very important stops and impressions that he was able to make on the world along the way. The added use of videos images and photographs on the screen behind him help get the viewer into the right mood regarding the various times and places of many of the events described as things move along. Recommended!